...still funny after all these years! As you know, the 60's TV show Hogan's Heroes was set in a POW camp called Stalag 13, near the town of Hammelburg in World War II Germany. I had kind of assumed the camp and town were fictional, but no. 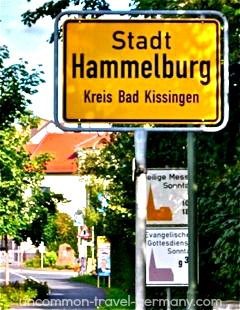 There really is a town called Hammelburg. And there really was a POW camp called Stalag 13 on the outskirts of Hammelburg. Hogan's Heroes was an enormously successful sitcom. It ran for six seasons from 1965 through 1971 and apparently will live forever in reruns. At any moment, those episodes are probably playing somewhere in the world. Even Germany was not immune to their offbeat, somewhat controversial humor. 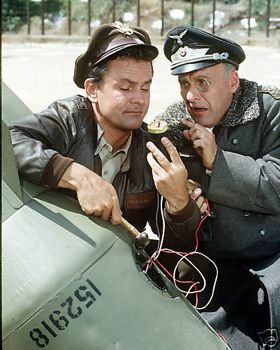 Hogan's Heroes was dubbed into German during the 90's and has been playing on German TV for years as well, where it runs as the very popular A Cage Full of Heroes (Ein Käfig voller Helden). The German version was recently released on DVD. I confess to having a bit of a Hogan's Heroes addiction. As a result, I couldn't resist visiting Hammelburg on one of my trips to Germany. Of course I also went out to look for the site of the former Stalag 13. Hammelburg turned out to be a delightful surprise! I would have been thrilled to be there, even if it had been dreary and boring, but it was nothing of the sort. 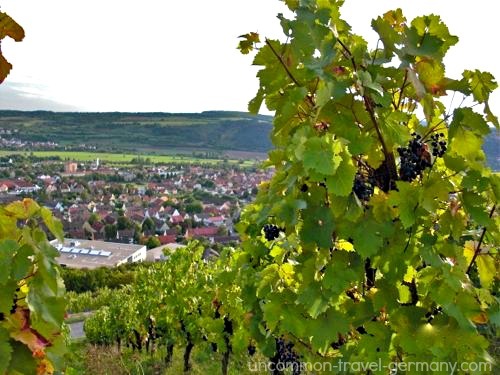 It is a pretty little town nestled in a steep valley, with vineyards climbing the hillsides and a medieval castle close by. Stalag 13 itself isn't there, but the area that housed the officers' part of the POW camp, Oflag 13, is still being used as a military post. Many of the old buildings are gone, but some remain, and it is now occupied by the German Army. One section is maintained as a graveyard for POW's who died there, as well as some brought from other burial sites. The camp is now the home of the German Infantry School. Consequently, Hammelburg is swarming with German soldiers, giving it an interesting twist. For more information on what Stalag 13 is like today, see Stalag 13 now. If you are curious about the history of the real Stalag 13, see Stalag 13 History. 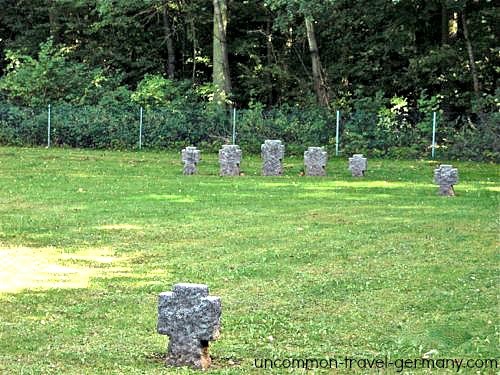 It's been a German army camp since WWI, and has held some famous prisoners. 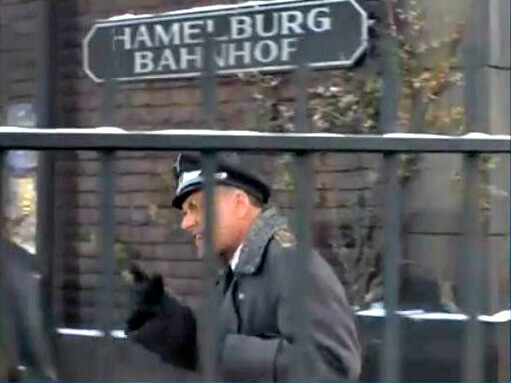 Hogan's Heroes was filmed on the back lot of Paramount Pictures. There's a great aerial view of the TV set on retroweb.com. Scroll about halfway down the page to the image "40 Acres in 1965" and click to enlarge it. The enlarged version has the movie and TV sets labeled. Stalag 13 is at the top right, above Gone with the Wind's Atlanta, and the town of Mayberry. This site, www.retroweb.com, has some fascinating photographs of many TV series and movie sets filmed on the "Lost Studio Backlot". It appears that Colonel Robert Hogan of Hogan's Heroes was a completely fictional character, and creator Bernard Fein named the character after an actor of the same name, who actually had small roles in two of the Hogan's Heroes episodes (Reservations Required in season 1, and Crittendon's Commandos in season 5). The odd thing is, there really was a POW named Robert Hogan in a Stalag 13, whose story bears striking similarities to the Hollywood version. The "real" Robert Hogan was a pilot flying B24 bombers out of Italy, who was shot down in January of 1945 over Yugoslavia and sent eventually to the Stalag 13 camp outside of Nuremberg (actually the Oflag 13 camp, since he was an officer. Stalags were only for enlisted men.) 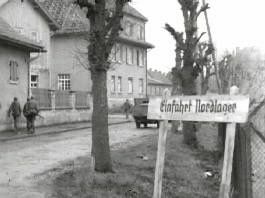 This camp was adjacent to Stalag 13 D, not the Stalag 13 C camp outside of Hammelburg, but close enough for the producers of the TV show to be interested when Dr. Robert Hogan contacted them. The real Robert Hogan got to meet Bob Crane of Hogan's Heroes in 1966. The POW's were reasonably well-treated by the German guards, though they were gradually starving to death. Of course, the German guards were not much better off than the prisoners - food was scarce. A young girl from the nearby village would occasionally throw pieces of fruit over the fences for the prisoners. He said that food was the thing they thought and talked about the most...and also dreamed about. The prisoners' rations consisted of only one meal a day: a bowl of "cabbage soup", which was nothing more than a bowl of warm water with a few cabbage leaves thrown in. Each barracks also shared one loaf of "bread", baked with a significant amount of sawdust mixed in to stretch it further. Though there was little similarity between his real-life experience and the Hogan's Heroes series, there were three significant things that were similar: 1) the commandant wore a monocle like Colonel Klink, 2) there was a big, fat, goofy sergeant like Sergeant Schulz, and 3) the prisoners had a "secret" radio. As for item #3, that radio was not very "secret". In fact, the commandant of the Stalag allowed the POW's to continue to operate their "clandestine" radio because the commandant got more reliable information from that source than he did from the official Nazi propaganda. For more information about Lt. Robert Hogan (later Dr. Robert Hogan), his life and wartime experiences, see this article from the Jefferson County Historical Association in Alabama. Here's a scene from The Missing Klink (Season 4, Episode 15). Klink is at the train station to meet General Burkhalter; check out the spelling. Want a taste of the Hogan's Heroes in German? Here is a scene from "Man's Best Friend Is Not His Dog", Season 4, Episode 6. Or "Sie Sind Rumpelstilzchen?" auf Deutsch. Newkirk stutters, and Schultz and Klink have exaggerated regional accents (Bavarian and Saxon).